Very Good. 034910641X ALL BOOKS SHIPPED WITHIN 1 DAY OF PURCHASE! I loved this book. The story is very smart the way the characters are developed and come together. I would recommend this highly. 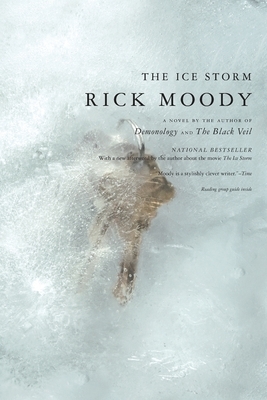 Can't wait to read other books by Rick Moody. In the Ice Storm Moody gives us the typical suburban family from the 70's. The father is a lech, mom is unhappy, the daughter has already developed a reputation and the son is unbalanced. In one night the family will fall apart. While mom and dad attend a key party at the neighbor's, the children are left to their own devices. The underlying theme to this story is sexual tension and how its freezing each family member out of the others lives. More cultural refs than a Billy Joel song! This book had more references than that famous Billy Joel song "We didn't start the fire"--Duraflame logs, Family Affair, Jonathan Livingston Seagull--from the beginning to the end. As one who had heard about the movie (and who was a youngster himself in the early 1970s) I tried to keep an open mind. I think I did, although I wish Moody had paid more attention to the story and the characters than to the cultural references. Do we really have have it shoved through our eyes and into our minds that no one enjoyed the swinging and other pleasures associated with the key parties? I'm not a prude but I didn't to be hammered and reminded that no one who participated in such events was very happy. As for the rating, I'd give it a three-and-a-half stars. For all of my critical comments, I'll have to admit that many members of my family went through similar anguish in the early 1970s. Moreover, my mother was a BIG Jonathan Livingston Seagull freak.